This article is about plastics made from renewable biomass. For the information on plastics that are biodegradable, see biodegradable plastic. life cycle assessments is favourable. Bioplastics are used for disposable items, such as packaging, crockery, cutlery, pots, bowls, and straws. Few commercial applications exist for bioplastics. In principle they could replace many applications for petroleum-derived plastics, however cost and performance remain problematic. As a matter of fact, their usage is favourable only if supported by specific regulations limiting the usage of conventional plastics. Typical is the example of Italy, where biodegradable plastic bags and shoppers are compulsory since 2011 with the introduction of a specific law. Beyond structural materials, electroactive bioplastics are being developed that promise to be used to carry electric current. Biopolymers are available as coatings for paper rather than the more common petrochemical coatings. Thermoplastic starch currently represents the most widely used bioplastic, constituting about 50 percent of the bioplastics market. Simple starch bioplastic can be made at home. Pure starch is able to absorb humidity, and is thus a suitable material for the production of drug capsules by the pharmaceutical sector. Flexibiliser and plasticiser such as sorbitol and glycerine can also be added so the starch can also be processed thermo-plastically. The characteristics of the resulting bioplastic (also called "thermo-plastical starch") can be tailored to specific needs by adjusting the amounts of these additives. Starch-based bioplastics are often blended with biodegradable polyesters to produce starch/polylactic acid, starch/polycaprolactone or starch/Ecoflex (polybutylene adipate-co-terephthalate produced by BASF). blends. These blends are used for industrial applications and are also compostable. 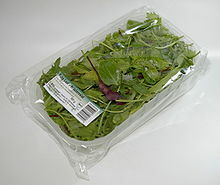 Other producers, such as Roquette, have developed other starch/polyolefin blends. These blends are not biodegradable, but have a lower carbon footprint than petroleum-based plastics used for the same applications. Due to the origin of its raw material, starch is cheap, abundant, and renewable. Starch based plastics are complex blends of starch with compostable plastics such as Polylactic acid, Polybutylene Adipate Terephthalate, Polybutylene Succinate, Polycaprolactone, and Polyhydroxyalkanoates. These complex blends improve water resistance as well as processing and mechanical properties. Starch-based films (mostly used for packaging purposes) are made mainly from starch blended with thermoplastic polyesters to form biodegradable and compostable products. These films are seen specifically in consumer goods packaging of magazine wrappings and bubble films. In food packaging, these films are seen as bakery or fruit and vegetable bags. Composting bags with this films are used in selective collecting of organic waste. 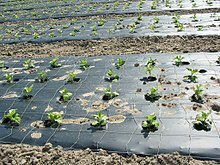 Further, a new starch-based film was developed by Agricultural Research Service scientists can even be used as a paper. Cellulose bioplastics are mainly the cellulose esters, (including cellulose acetate and nitrocellulose) and their derivatives, including celluloid. Cellulose can become thermoplastic when extensively modified. An example of this is cellulose acetate, which is expensive and therefore rarely used for packaging. However, cellulosic fibers added to starches can improve mechanical properties, permeability to gas, and water resistance due to being less hydrophilic than starch. A group at Shanghai University was able to construct a novel green plastic based on cellulose through a method called hot pressing. Bioplastics can be made from proteins from different sources. For example, wheat gluten and casein show promising properties as a raw material for different biodegradable polymers. Additionally, soy protein is being considered as another source of bioplastic. Soy proteins have been used in plastic production for over one hundred years. For example, body panels of an original Ford automobile were made of soy-based plastic. 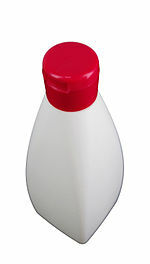 There are difficulties with using soy protein-based plastics due to their water sensitivity and relatively high cost. Therefore, producing blends of soy protein with some already-available biodegradable polyesters improves the water sensitivity and cost. The aliphatic biopolyesters are mainly polyhydroxyalkanoates (PHAs) like the poly-3-hydroxybutyrate (PHB), polyhydroxyvalerate (PHV) and polyhydroxyhexanoate (PHH). Polylactic acid (PLA) is a transparent plastic produced from corn or dextrose. Superficially, it is similar to conventional petrochemical-based mass plastics like PS. It has the distinct advantage of degrading to nontoxic products. Unfortunately it exhibits inferior impact strength, thermal robustness, and barrier properties (blocking air transport across the membrane). PLA and PLA blends generally come in the form of granulates with various properties, and are used in the plastic processing industry for the production of films, fibers, plastic containers, cups and bottles. PLA is also the most common type of plastic filament used for home fused deposition modeling. 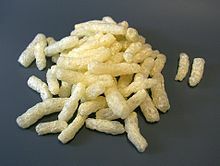 Polyhydroxyalkanoates are linear polyesters produced in nature by bacterial fermentation of sugar or lipids. They are produced by the bacteria to store carbon and energy. In industrial production, the polyester is extracted and purified from the bacteria by optimizing the conditions for the fermentation of sugar. More than 150 different monomers can be combined within this family to give materials with extremely different properties. PHA is more ductile and less elastic than other plastics, and it is also biodegradable. These plastics are being widely used in the medical industry. PA 11 is a biopolymer derived from natural oil. It is also known under the tradename Rilsan B, commercialized by Arkema. PA 11 belongs to the technical polymers family and is not biodegradable. Its properties are similar to those of PA 12, although emissions of greenhouse gases and consumption of nonrenewable resources are reduced during its production. Its thermal resistance is also superior to that of PA 12. It is used in high-performance applications like automotive fuel lines, pneumatic airbrake tubing, electrical cable antitermite sheathing, flexible oil and gas pipes, control fluid umbilicals, sports shoes, electronic device components, and catheters. 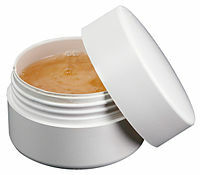 A similar plastic is Polyamide 410 (PA 410), derived 70% from castor oil, under the trade name EcoPaXX, commercialized by DSM. PA 410 is a high-performance polyamide that combines the benefits of a high melting point (approx. 250 °C), low moisture absorption and excellent resistance to various chemical substances. 2 per tonne of Green Polyethylene produced. With GM corn being a common feedstock, it is unsurprising that some bioplastics are made from this. Under the bioplastics manufacturing technologies there is the "plant factory" model, which uses genetically modified crops or genetically modified bacteria to optimise efficiency. Recently, there have been a large emphasis on producing biobased and isocyanate-free polyurethanes. One such example utilizes a spontaneous reaction between polyamines and cyclic carbonates to produce polyhydroxurethanes. Unlike traditional cross-linked polyurethanes, cross-linked polyhydroxyurethanes have been shown to be capable of recycling and reprocessing through dynamic transcarbamoylation reactions. A number bioplastic classes have been synthesized from plant and animal derived fats and oils. Polyurethanes, polyesters, epoxy resins and a number of other types of polymers have been developed with comparable properties to crude oil based materials. The recent development of olefin metathesis has opened a wide variety of feedstocks to economical conversion into biomonomers and polymers. With the growing production of traditional vegetable oils as well as low cost microalgae derived oils, there is huge potential for growth in this area. Although bioplastics save more nonrenewable energy than conventional plastics and emit less GHG compared to conventional plastics, bioplastics also have negative environmental impacts such as eutrophication and acidification. Bioplastics induce higher eutrophication potentials than conventional plastics. Biomass production during industrial farming practices causes nitrate and phosphate to filtrate into water bodies; this causes eutrophication which is the richness of the nutrients in body waters. Eutrophication is a threat to water resources around the world since it kills aquatic organisms, creates dead zones and causes harmful algal blooms. Bioplastics also increase acidification. The high increase in eutrophication and acidification caused by bioplastics is also caused by using chemical fertilizer in the cultivation of renewable raw materials to produce bioplastics. Although bioplastics are extremely advantageous because they reduce non-renewable consumption and GHG emissions, they also negatively affect the environment through land and water consumption, using pesticide and fertilizer, eutrophication and acidification; hence one's preference for either bioplastics or conventional plastics depends on what one considers the most important environmental impact. Another issue with bioplastics, is that some bioplastics are made from the edible parts of crops. This makes the bioplastics compete with food production because the crops that produce bioplastics can also be used to feed people. These bioplastics are called "1st generation feedstock bioplastics". 2nd generation feedstock bioplastics use non-food crops (cellulosic feedstock) or waste materials from 1st generation feedstock (e.g. waste vegetable oil). 3rd generation feedstock bioplastics use algae as the feedstock. Biodegradation of any plastic is a process that happens at solid/liquid interface whereby the enzymes in the liquid phase depolymerize the solid phase  Both bioplastics and conventional plastics containing additives are able to biodegrade. Bioplastics are able to biodegrade in different environments hence they are more acceptable than conventional plastics. Biodegradability of bioplastics occurs under various environmental conditions including soil, aquatic environments and compost. Both the structure and composition of biopolymer or bio-composite have an effect on the biodegradation process, hence changing the composition and structure might increase biodegradability. Soil and compost as environment conditions are more efficient in biodegradation due to their high microbial diversity. Composting not only biodegrades bioplastics efficiently but it also significantly reduces the emission of greenhouse gases. Biodegradability of bioplastics in compost environments can be upgraded by adding more soluble sugar and increasing temperature. Soil environments on the other hand have high diversity of microorganisms making it easier for biodegradation of bioplastics to occur. However, bioplastics in soil environments need higher temperatures and a longer time to biodegrade. Some bioplastics biodegrade more efficiently in water bodies and marine systems; however, this causes danger to marine ecosystems and freshwater. Hence it is accurate to conclude that biodegradation of bioplastics in water bodies which leads to the death of aquatic organisms and unhealthy water can be noted as one of the negative environmental impacts of bioplastics. While plastics based on organic materials were manufactured by chemical companies throughout the 20th century, the first company solely focused on bioplastics- Marlborough Biopolymers- was founded in 1983. However, Marlborough and other ventures that followed failed to find commercial success, with the first such company to secure long-term financial success being the Italian company Novamont, founded in 1989. Because of the fragmentation in the market and ambiguous definitions it is difficult to describe the total market size for bioplastics, but estimates put global production capacity at 327,000 tonnes. In contrast, global production of polyethylene (PE) and polypropylene (PP), the world's leading petrochemical derived polyolefins, was estimated at over 150 million tonnes in 2015. 1940-1945: During World War II, an increase in plastic production is seen as it is used in many wartime materials. Due to government funding and oversight the United States production of plastics (in general, not just bioplastics) tripled during 1940-1945(Rogers 2005). 1950s: Amylomaize (>50% amylose content corn) was successfully bred and commercial bioplastics applications started to be explored. (Liu, Moult, Long, 2009) A decline in bioplastic development is seen due to the cheap oil prices, however the development of synthetic plastics continues. 2018: Many developments occur including Ikea starting industrial production of bioplastics furniture (Barret 2018), Project Effective focusing on replacing nylon with bio-nylon (Barret 2018), and the first packaging made from fruit (Barret 2018). 2019: Five different types of Chitin nanomaterials were extracted and synthesized by the 'Korea Research Institute of Chemical Technology' to verify strong personality and antibacterial effects. When buried underground, 100% biodegradation was possible within 6 months. The EN 13432 industrial standard is arguably the most international in scope. This standard must be met in order to claim that a plastic product is compostable in the European marketplace. In summary, it requires biodegradation of 90% of the materials in a lab within 90 days. The ASTM 6400 standard is the regulatory framework for the United States and sets a less stringent threshold of 60% biodegradation within 180 days for non-homopolymers, and 90% biodegradation of homopolymers within industrial composting conditions (temperatures at or above 140F). Municipal compost facilities do not see above 130F. Many starch-based plastics, PLA-based plastics and certain aliphatic-aromatic co-polyester compounds, such as succinates and adipates, have obtained these certificates. Additive-based bioplastics sold as photodegradable or Oxo Biodegradable do not comply with these standards in their current form. that which is capable of undergoing biological decomposition in a compost site such that the material is not visually distinguishable and breaks down into carbon dioxide, water, inorganic compounds and biomass at a rate consistent with known compostable materials. This definition drew much criticism because, contrary to the way the word is traditionally defined, it completely divorces the process of "composting" from the necessity of it leading to humus/compost as the end product. The only criterion this standard does describe is that a compostable plastic must look to be going away as fast as something else one has already established to be compostable under the traditional definition. This guide covered suggested criteria, procedures, and a general approach to establish the compostability of environmentally degradable plastics. There is an important difference between biodegradability and biobased content. A bioplastic such as high-density polyethylene (HDPE) can be 100% biobased (i.e. contain 100% renewable carbon), yet be non-biodegradable. These bioplastics such as HDPE nonetheless play an important role in greenhouse gas abatement, particularly when they are combusted for energy production. The biobased component of these bioplastics is considered carbon-neutral since their origin is from biomass. ^ Hong Chua; Peter H. F. Yu & Chee K. Ma (March 1999). "Accumulation of biopolymers in activated sludge biomass". Applied Biochemistry and Biotechnology. 78 (1–3): 389–399. doi:10.1385/ABAB:78:1-3:389. ISSN 0273-2289. ^ Carrington, Damian (5 July 2018). "Researchers race to make bioplastics from straw and food waste". theguardian.com. ^ News, A. B. C. (29 December 2008). "Biodegradable plastic made from plants, not oil, is emerging". abcnews.go.com. ^ "Bioplastics (PLA) - World Centric". worldcentric.org. ^ a b Vert, Michel (2012). "Terminology for biorelated polymers and applications (IUPAC Recommendations 2012)" (PDF). Pure and Applied Chemistry. 84 (2): 377–410. doi:10.1351/PAC-REC-10-12-04. ^ Chen, G.; Patel, M. (2012). "Plastics derived from biological sources: Present and future: P technical and environmental review". Chemical Reviews. 112 (4): 2082–2099. doi:10.1021/cr200162d. PMID 22188473. ^ "Consiglio dei Ministri conferma la messa al bando dei sacchetti di plastica non biodegradabili - Ministero dell'Ambiente e della Tutela del Territorio e del Mare". minambiente.it. ^ Suszkiw, Jan (December 2005). "Electroactive Bioplastics Flex Their Industrial Muscle". News & Events. USDA Agricultural Research Service. Retrieved 2011-11-28. ^ Khwaldia, Khaoula; Elmira Arab-Tehrany; Stephane Desobry (2010). "Biopolymer Coatings on Paper Packaging Materials". Comprehensive Reviews in Food Science and Food Safety. 9 (1): 82–91. doi:10.1111/j.1541-4337.2009.00095.x. ^ Make Potato Plastic!. Instructables.com (2007-07-26). Retrieved on 2011-08-14. ^ Khalid, Saud; Yu, Long; Meng, Linghan; Liu, Hongsheng; Ali, Amjad; Chen, Ling (2017). "Poly(lactic acid)/starch composites: Effect of microstructure and morphology of starch granules on performance". Journal of Applied Polymer Science. 134 (46): n/a. doi:10.1002/app.45504. ^ "Starch based Bioplastic Manufacturers and Suppliers". 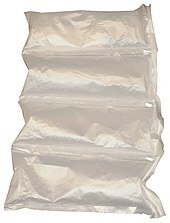 bioplasticsonline.net. Archived from the original on August 14, 2011. ^ Sherman, Lilli Manolis (1 July 2008). "Enhancing biopolymers: additives are needed for toughness, heat resistance & processability". Plastics Technology. Archived from the original on 17 April 2016. ^ "BASF announces major bioplastics production expansion". ^ "Roquette, nouvel acteur sur le marché des plastiques, lance GAÏALENE® : une gamme innovante de plastique végétal". ^ "Starch can replace normal plastic in food packaging". Phys.Org. 12 June 2018. Archived from the original on 2018-12-14. Retrieved 2018-12-14. ^ Avant, Sandra (April 2017). "Better Paper, Plastics With Starch". USDA. Archived from the original on 2018-12-14. Retrieved 2018-12-14. ^ Cate, Peter (January 2017). "Collaboration delivers better results". Reinforced Plastics. 61 (1): 51–54. doi:10.1016/j.repl.2016.09.002. ISSN 0034-3617. ^ Song, Na; Hou, Xingshuang; Chen, Li; Cui, Siqi; Shi, Liyi; Ding, Peng (2017-05-16). "A Green Plastic Constructed from Cellulose and Functionalized Graphene with High Thermal Conductivity". ACS Applied Materials & Interfaces. 9 (21): 17914–17922. doi:10.1021/acsami.7b02675. ISSN 1944-8244. PMID 28467836. ^ Song, J. H.; Murphy, R. J.; Narayan, R.; Davies, G. B. H. (2009-07-27). "Biodegradable and compostable alternatives to conventional plastics". Philosophical Transactions of the Royal Society B: Biological Sciences. 364 (1526): 2127–2139. doi:10.1098/rstb.2008.0289. ISSN 0962-8436. PMC 2873018. PMID 19528060. ^ Ralston, Brian E.; Osswald, Tim A. (February 2008). "The History of Tomorrow's Materials: Protein-Based Biopolymers". Plastics Engineering. 64 (2): 36–40. doi:10.1002/j.1941-9635.2008.tb00292.x. ISSN 0091-9578. ^ Zhang, Jinwen; Jiang, Long; Zhu, Linyong; Jane, Jay-lin; Mungara, Perminus (May 2006). "Morphology and Properties of Soy Protein and Polylactide Blends". Biomacromolecules. 7 (5): 1551–1561. doi:10.1021/bm050888p. ISSN 1525-7797. PMID 16677038. ^ "History, Travel, Arts, Science, People, Places - Smithsonian". smithsonianmag.com. ^ "Mirel: PHAs grades for Rigid Sheet and Thermoforming". ^ "Micromidas is using carefully constructed populations of bacteria to convert organic waste into bio-degradable plastics". Archived from the original on October 23, 2011. ^ Nohra, Bassam; Laure Candy; Jean-Francois Blanco; Celine Guerin; Yann Raoul; Zephirin Mouloungui (2013). "From Petrochemical Polyurethanes to Biobased Polyhydroxyurethanes". Macromolecules. 46 (10): 3771–3792. doi:10.1021/ma400197c. ^ Fortman, David J.; Jacob P. Brutman; Christopher J. Cramer; Marc A. Hillmyer; William R. Dichtel (2015). "Mechanically Activated, Catalyst-Free Polyhydroxyurethane Vitrimers". Journal of the American Chemical Society. 137 (44): 14019–14022. doi:10.1021/jacs.5b08084. PMID 26495769. ^ Meier, Michael A. R.; Metzger, Jürgen O.; Schubert, Ulrich S. (2007-10-02). "Plant oil renewable resources as green alternatives in polymer science". Chemical Society Reviews. 36 (11): 1788. doi:10.1039/b703294c. ISSN 1460-4744. ^ Floros, Michael; Hojabri, Leila; Abraham, Eldho; Jose, Jesmy; Thomas, Sabu; Pothan, Laly; Leao, Alcides Lopes; Narine, Suresh (2012). "Enhancement of thermal stability, strength and extensibility of lipid-based polyurethanes with cellulose-based nanofibers". Polymer Degradation and Stability. 97 (10): 1970–1978. doi:10.1016/j.polymdegradstab.2012.02.016. ^ Pillai, Prasanth K. S.; Floros, Michael C.; Narine, Suresh S. (2017-07-03). "Elastomers from Renewable Metathesized Palm Oil Polyols". ACS Sustainable Chemistry & Engineering. 5 (7): 5793–5799. doi:10.1021/acssuschemeng.7b00517. ^ Can, E.; Küsefoğlu, S.; Wool, R. P. (2001-07-05). "Rigid, thermosetting liquid molding resins from renewable resources. I. Synthesis and polymerization of soy oil monoglyceride maleates". Journal of Applied Polymer Science. 81 (1): 69–77. doi:10.1002/app.1414. ISSN 1097-4628. ^ Stemmelen, M.; Pessel, F.; Lapinte, V.; Caillol, S.; Habas, J.-P.; Robin, J.-J. (2011-06-01). "A fully biobased epoxy resin from vegetable oils: From the synthesis of the precursors by thiol-ene reaction to the study of the final material". Journal of Polymer Science Part A: Polymer Chemistry. 49 (11): 2434–2444. doi:10.1002/pola.24674. ISSN 1099-0518. ^ Meier, Michael A. R. (2009-07-21). "Metathesis with Oleochemicals: New Approaches for the Utilization of Plant Oils as Renewable Resources in Polymer Science". Macromolecular Chemistry and Physics. 210 (13–14): 1073–1079. doi:10.1002/macp.200900168. ISSN 1521-3935. ^ Mata, Teresa M.; Martins, António A.; Caetano, Nidia. S. (2010). "Microalgae for biodiesel production and other applications: A review". Renewable and Sustainable Energy Reviews. 14 (1): 217–232. doi:10.1016/j.rser.2009.07.020. hdl:10400.22/10059. ^ a b c d e f Gironi, F., and Vincenzo Piemonte. “Bioplastics and Petroleum-Based Plastics: Strengths and Weaknesses.” Energy Sources, Part A: Recovery, Utilization and Environmental Effects, vol. 33, no. 21, 2011, pp. 1949–59, doi:10.1080/15567030903436830. ^ Yates, Madeleine R., and Claire Y. Barlow. “Life Cycle Assessments of Biodegradable, Commercial Biopolymers - A Critical Review.” Resources, Conservation and Recycling, vol. 78, Elsevier B.V., 2013, pp. 54–66, doi:10.1016/j.resconrec.2013.06.010. ^ "Are biodegradable plastics better for the environment?". Axion. 6 February 2018. Archived from the original on 2018-12-14. Retrieved 2018-12-14. ^ Miles, Lindsay (22 March 2018). "Biodegradable Plastic: Is It Really Eco-Friendly?". Archived from the original on 2018-12-14. Retrieved 2018-12-14. ^ a b c d e f g h i Weiss, Martin, et al. “A Review of the Environmental Impacts of Biobased Materials.” Journal of Industrial Ecology, vol. 16, no. SUPPL.1, 2012, doi:10.1111/j.1530-9290.2012.00468.x. ^ Brockhaus, Sebastian, et al. “A Crossroads for Bioplastics: Exploring Product Developers’ Challenges to Move beyond Petroleum-Based Plastics.” Journal of Cleaner Production, vol. 127, Elsevier Ltd, 2016, pp. 84–95, doi:10.1016/j.jclepro.2016.04.003. ^ Sinha, E., et al. “Eutrophication Will Increase during the 21st Century as a Result of Precipitation Changes.” Science, vol. 357, no. July, 2017, pp. 405–08. ^ Rosas, Francisco, et al. “Nitrous Oxide Emission Reductions from Cutting Excessive Nitrogen Fertilizer Applications.” Climatic Change, vol. 132, no. 2, 2015, pp. 353–67, doi:10.1007/s10584-015-1426-y. ^ Gironi, F., and Vincenzo Piemonte. “Land-Use Change Emissions: How Green Are the Bioplastics?” Environmental Progress & Sustainable Energy, vol. 30, no. 4, 2010, pp. 685–691, doi:10.1002/ep.10518. ^ Degli-Innocenti, Francesco. “Biodegradation of Plastics and Ecotoxicity Testing: When Should It Be Done.” Frontiers in Microbiology, vol. 5, no. SEP, 2014, pp. 1–3, doi:10.3389/fmicb.2014.00475. ^ Gómez, Eddie F., and Frederick C. Michel. “Biodegradability of Conventional and Bio-Based Plastics and Natural Fiber Composites during Composting, Anaerobic Digestion and Long-Term Soil Incubation.” Polymer Degradation and Stability, vol. 98, no. 12, 2013, pp. 2583–2591., doi:10.1016/j.polymdegradstab.2013.09.018. ^ a b c d e f g h i Emadian, S. Mehdi, et al. “Biodegradation of Bioplastics in Natural Environments.” Waste Management, vol. 59, Elsevier Ltd, 2017, pp. 526–36, doi:10.1016/j.wasman.2016.10.006. ^ Barrett, Axel (5 September 2018). "The History and Most Important Innovations of Bioplastics". Bioplastics News. ^ a b c d "Ready to Grow: The Biodegradable Polymers Market". Plastics Engineering. 72 (3): 1–4. March 2016. doi:10.1002/j.1941-9635.2016.tb01489.x. ISSN 0091-9578. ^ Darby, Debra (August 2012). "Bioplastics Industry Report". BioCycle. 53 (8): 40–44 – via ProQuest. ^ Rujnić-Sokele, Maja; Pilipović, Ana (September 2017). "Challenges and Opportunities of Biodegradable Plastics: A Mini Review". Waste Management and Research. 35 (2): 132–140. doi:10.1177/0734242x16683272. PMID 28064843 – via SAGE Journals. ^ Pathak, Swathi (December 2014). "Bioplastic: Its Timeline Based Scenario & Challenges". Journal of Polymer and Biopolymer Physics Chemistry. 2 (4): 84–90. doi:10.12691/jpbpc-2-4-5 (inactive 2019-03-16) – via SciePub. ^ "Bioplastics Market Analysis, Market Size, Application Analysis, Regional Outlook, Competitive Strategies And Forecasts, 2016 To 2024". Market Research Results & Consulting. Grand View Research. 2015. ^ Market Study Bioplastics, 3rd edition. Ceresana. Retrieved on 2014-11-25. ^ "Global Market for Bioplastics to Grow by 20%". PlasticsToday. UBM Americas. 29 November 2017. ^ a b NNFCC Renewable Polymers Factsheet: Bioplastics — NNFCC. Nnfcc.co.uk (2010-02-19). Retrieved on 2011-08-14. ^ Beckman, Eric (9 August 2018). "The World of Plastics, in Numbers". theconversation.com. ^ Lampinen, Johanna (2010). "Trends in Bioplastics and Biocomposites". VTT Research Notes. 2558: 12–20. ^ "GLOBAL MARKET TRENDS AND INVESTMENTS IN POLYETHYLENE AND POLYPROPYLENE" (PDF). ^ White, J. L. (December 1998). "Fourth in a Series: Pioneers of Polymer Processing Alexander Parkes". International Polymer Processing. 13 (4): 326. doi:10.3139/217.980326. ISSN 0930-777X. ^ a b "A Brief History of Plastic". The Brooklyn Rail. Retrieved 2018-09-27. ^ d-2016-154. 2016. doi:10.18411/d-2016-154. ISBN 9785912430725. ^ "New fibre could make stronger parts". Reinforced Plastics. 39 (5): 17. May 1995. doi:10.1016/0034-3617(95)91746-2. ISSN 0034-3617. ^ "Novamont". Bioplastics News. 2013-12-30. Retrieved 2018-09-27. ^ Poirier, Yves; Dennis, Douglas; Klomparens, Karen; Nawrath, Christiane; Somerville, Chris (December 1992). "Perspectives on the production of polyhydroxyalkanoates in plants". FEMS Microbiology Letters. 103 (2–4): 237–246. doi:10.1111/j.1574-6968.1992.tb05843.x. ISSN 0378-1097. ^ Lörcks, Jürgen (January 1998). "Properties and applications of compostable starch-based plastic material". Polymer Degradation and Stability. 59 (1–3): 245–249. doi:10.1016/s0141-3910(97)00168-7. ISSN 0141-3910. ^ "Monsanto finds buyer for oil and gas assets". Chemical & Engineering News. 63 (48): 5. 1985-12-02. doi:10.1021/cen-v063n048.p005a. ISSN 0009-2347. ^ "The History and Most Important Innovations of Bioplastics". Bioplastics News. 2018-07-05. Retrieved 2018-09-27. ^ Pennisi, Elizabeth (1992-05-16). "Natureworks". Science News. 141 (20): 328–331. doi:10.2307/3976489. ISSN 0036-8423. JSTOR 3976489. ^ DiGregorio, Barry E. (January 2009). "Biobased Performance Bioplastic: Mirel". Chemistry & Biology. 16 (1): 1–2. doi:10.1016/j.chembiol.2009.01.001. ISSN 1074-5521. PMID 19171300. ^ "Nanotube technology gains US patent". Reinforced Plastics. 48 (10): 17. November 2004. doi:10.1016/s0034-3617(04)00461-8. ISSN 0034-3617. ^ Bayer, Ilker S.; Guzman-Puyol, Susana; Heredia-Guerrero, José Alejandro; Ceseracciu, Luca; Pignatelli, Francesca; Ruffilli, Roberta; Cingolani, Roberto; Athanassiou, Athanassia (2014-07-15). "Direct Transformation of Edible Vegetable Waste into Bioplastics". Macromolecules. 47 (15): 5135–5143. doi:10.1021/ma5008557. ISSN 0024-9297. ^ Sharif Hossain, A.B.M. ; Ibrahim, Nasir A.; AlEissa, Mohammed Saad (September 2016). "Nano-cellulose derived bioplastic biomaterial data for vehicle bio-bumper from banana peel waste biomass". Data in Brief. 8: 286–294. doi:10.1016/j.dib.2016.05.029. ISSN 2352-3409. PMC 4906129. PMID 27331103. ^ Brodin, Malin; Vallejos, María; Opedal, Mihaela Tanase; Area, María Cristina; Chinga-Carrasco, Gary (September 2017). "Lignocellulosics as sustainable resources for production of bioplastics – A review". Journal of Cleaner Production. 162: 646–664. doi:10.1016/j.jclepro.2017.05.209. ISSN 0959-6526. ^ Benvenuto, Mark A. (2018-01-20). "26 Biofuels and bioplastics". doi:10.1515/spark.32.27. ^ "ASTM D6002 - 96(2002)e1 Standard Guide for Assessing the Compostability of Environmentally Degradable Plastics (Withdrawn 2011)". astm.org. ^ "ASTM D6866 - 11 Standard Test Methods for Determining the Biobased Content of Solid, Liquid, and Gaseous Samples Using Radiocarbon Analysis". Astm.org. Retrieved 2011-08-14. ^ "NNFCC Newsletter – Issue 16. Understanding Bio-based Content — NNFCC". Nnfcc.co.uk. 2010-02-24. Retrieved 2011-08-14. ^ "Braskem". Braskem. Retrieved 2011-08-14. Wikimedia Commons has media related to Bioplastics.